Have an overnight getaway or stay for a week at Caesars Hotel & Casino in Atlantic City. Drive down or take a plane to Atlantic City and experience The Boardwalk and all of its beautiful features. Caesars is a Hotel and a Casino, it is a good getaway from someone looking to relax as well as a high roller coming into town to play tens of thousand of dollars on blackjack and slots. Staying in this Luxury Hotel & Casino It is like being in ancient Rome on the boardwalk. While you may want to rest and relax, all of the nightlife and other activities are right outside of the door on the boardwalk. There is casual dining; immaculate hotel rooms, and the top entertainment money can buy. The staff at Caesars Hotel and Casino will make you feel at home with their luxurious accommodations and VIP treatment. Once you walk into the hotel you will notice beautiful escalators, which lead to the impeccably decorated lobby. 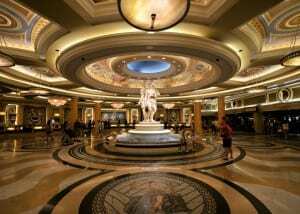 The four stories Lobby is designed after the Ancient Rome, it serves over one thousand guests with an interactive state of the art check in a check out. There are four towers in Caesars Hotel & Casino. They are the regular Lobby; the Ocean Tower, with its updated decorated suites and the Centurion Tower. Caesars Hotel & Casino is known to have excellent games such as slots, craps, blackjack, and all casino games. There are grandiose poker tournaments for recreational players as well as people who play for high stakes. The Casino area is immaculate and grandiose; it is filled with action and filled with cash to win. There are a huge variety of slots to play, and in addition to this there is a new poker arena. The Poker Arena consists of twenty smoke free gambling tables, which are surrounded by fifty-inch televisions. Only experienced dealers are allowed to deal blackjack at Caesars Hotel & Casino so you can rest assured you know you will be entertained by the best. Besides playing slots and other casino games, there are amazing things to do at night. Caesars Circus Maximus Theater is luxurious and features stadium sized seats with full service and an impeccable surround sound system. The Caesars Circus Maximus Theater has a full bar, music, athletes, and much more. Are you over twenty-one years old? If so you can go to the 21 Sports bar, which can be found, on the second floor of the hotel casino. The bar hosts all of the major sporting events, has excellent liquor with excellent service. If you are look to play slots or any casino game in Atlantic City, Caesars Hotel & Casino is the right place for you.